Last week Matthias Wendt and I have put our first joint paper on the arXiv, it's called "A¹-fundamental groups of isotropic reductive groups" and here I will tell you how you can think about it without going through all definitions. I have blogged about this before, but until a few days ago, there was only my diploma thesis in german and an extended abstract in english online, and the results were not as general (oh, and the proofs were also not the best...). Every simplicial set admits a universal covering space. 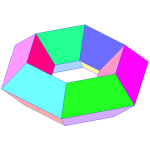 If the simplicial set is a simplicial group, the covering can be given a group structure, such that the covering map is a group homomorphism. This can be done "at once" without using geometric realizations, just by close analysis of the usual construction of the universal covering. Let be a simplicial group, its path space, its loop space and the kernel of the projection , which consists of all contractible loops. The composition of with the inclusion yields a monomorphism whose cokernel we denote by . I claim that this simplicial group already does the job. 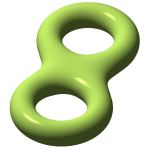 In this post, I will sketch a classification of Riemann surfaces. For those who haven't heard about the subject before, there is an introduction. For the impatient, look at the bottom of the post, where I have written a very short summary.